Ever hear that expression? It’s one of my favorite because it rings so true and it was created solely for the purpose of tormenting me by reminding me of opportunities lost! One of my biggest hindsight is 20/20 moments was a couple years back, when I visited Scotland and DIDN’T play golf while I was there….. I know, it’s like I committed golf’s number one unforgivable sin. In my defense (as shabby as it may be), I was not a true golfer, only the occasional weekend duffer who had no real clue as to what Scotland means for the greatest game on earth. Regardless of how many countries and time periods claim to have founded Golf, the most widely accepted account is that the modern game of golf originated in Scotland around the 12th century, with shepherds knocking stones into rabbit holes on the current site of the Royal and Ancient Golf Club of St. Andrews. Home of my ancestors (on my grandmothers side, hooooooooo Clan Buchanan) and an all around cool place to visit! My travels took me to Edinburgh, the capital of Scotland. 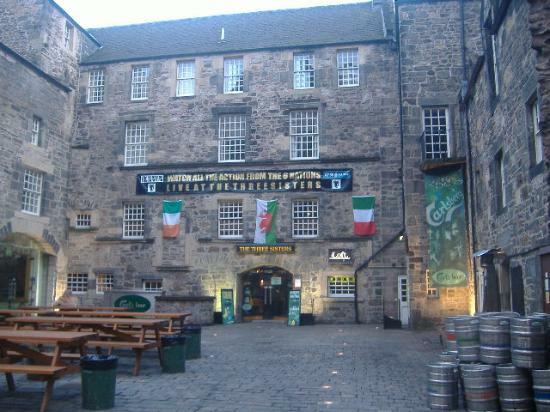 Edinburgh is one of the world’s most famous tourist destinations, where culture and history ooze from every pore, and the city pulses with the amazing energy created by the clash of a multicultural population and an influx of international visitors. Great architectural contrasts are born from the Scottish capital’s rich and varied history, and the atmosphere ensures that Edinburgh remains one of the world’s most enjoyable cities. Not to mention that the denizens are some of the most down to earth and easy going folks you can hope to encounter on your travels. Whilst there, we stayed in a co-ed hostel which was quite an attraction in itself, toured the city sightseeing, visited the Holyrood Palace, Edinburgh Castle, Scott Monument, participated in the holy mile pub crawl, shot the three sisters, encountered my first stag and hen night, witnessed a traditional Scottish wedding, touched a gravestone that was older than the United States of America, saw my first game of lawn bowling and climbed Arthur’s Seat. Never did it occur to me that I was in the heart of a city that boasts some of the finest golf in scotland. At the heart of the Lothians, Edinburgh is also surrounded by some of Scotland’s greatest golf courses, and can be the starting point for an amazing city golf tour. The inner city, while densely populated, is studded with superb courses like Royal Burgess, Mortonhall and Braid Hills, while the easy access to East Lothian opens up a world of golfing legends – Gullane, Muirfield, Archerfield, Craigielaw and Luffness are but a few of the most sought after names. To this day, I still kick myself whenever I think about my trip to Scotland, it’s not every day you get the opportunity to experience golf at it’s finest, smack dab in the heart of the country where it has it’s origins. I plan to make it back however, to take the pilgrimage like every golfer must, to play golf in it’s truest form, to travel to St. Andrews and stand on that Swilican bridge where generations of golfers have trudged before and relive some of the greatest moments in golf history. How many of you have taken a golf pilgrimage to Scotland? Where did you go and which courses did you play?